Analysis: A Formula for Seriously Challenging the Dean...? UPDATED 11:25AM: To include additional details and to reflect a correction. Tsongas and Clark are 4th & 5th women to represent Mass. in the House, not 5th and 6th. It turns out voters in Western Massachusetts shall not go without their own fun in 2018. 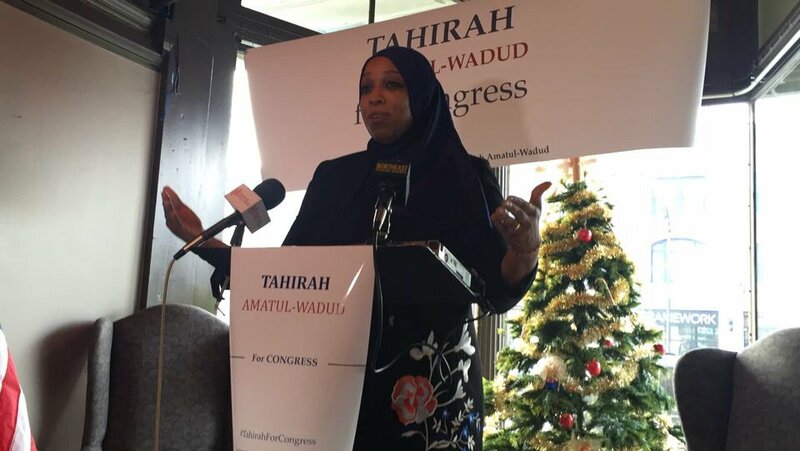 On Monday, Tahirah Amatul-Wadud, a lawyer and activist, announced she would challenge United States Representative Richard Neal in the Democratic primary for Massachusetts’s First Congressional District. Like his previous opponents, Amatul-Wadud faces stiff headwinds. However, she seeks the seat in a unique moment. Democrats face increasing pressure to utilize all available tools to battle Donald Trump and Republicans’ increasingly plutocratic agenda. Indeed, as her splashy website suggests, Amatul-Wadud is pitching a progressive platform on issues from economics to the environment. Yet, her run also hopes to capitalize on political shifts within the district Neal represents. The 1st Congressional District encompasses all or virtually all of Berkshire and Hampden counties, the western fringes of Franklin and Hampshire counties and the southwestern corner of Worcester County. Amatul-Wadud faces incredibly high hurdles to success. While there is an activist pool, perhaps even a left-wing one, to activate in the 1st, Neal has maintained a preeminent position in Valley politics. A former mayor of Springfield, he succeeded Edward Boland without a contested primary. Even as the suburbs reddened and later Northampton was added to—and later excised from—the district, he has withstood challenges. Always a potent, if understated force in Washington, Neal’s profile has risen since becoming dean of the commonwealth’s House delegation. Last year, he became the top Democrat on the House Ways & Means when California Governor Jerry Brown tapped his rival, Los Angeles Congressman Xavier Becerra, to replace now-Senator Kamala Harris as California’s attorney general. But that closeness to leadership has also attracted complaints from the left. Among the artists colonies and gentrified ex-mill towns nestled in the Berkshires, certain votes and accusations of Springfield-centrism may have emboldened critics. Amatul-Wadud, 44, is running at the right time in Springfield politics, too. Black, Muslim and a woman, she checks several boxes that are largely unfilled in the city and region’s politics. Indeed, her gender has ostensibly fueled some of the early interest in her candidacy. Amatul-Wadud serves on the Massachusetts Commission on the Status of Women. Indeed, her campaign materials connect her experience as a mother and advocacy for women and girls to her platform. Massachusetts has a poor record of electing women to Congress. Nikki Tsongas and Katherine Clark are only the fourth and fifth Bay State women to serve in the House. None of the other three were from the 413. Elizabeth Warren is the first woman to serve as a Senator from Massachusetts. The interest within the left to either seriously challenge Neal or at least press him to move their way will be crucial. Sources have indicated to WMassP&I that Amatul-Wadud was not recruited by progressive activists per se. Some on the left suspect she was looking at a bid before they and she connected. Another person whom activists approached and who now holds office declined, one source said. She was, however, an attractive candidate for activists looking to apply pressure to the incumbent. Being from Springfield and invested in the community at least offers hope of wedging support out from Neal’s base. The last time Neal had even a semblance of competition was in 2012. He faced former Pittsfield State Senator Andrea Nuciforo and Berkshire County activist Bill Shein after redistricting. Even had they not eaten into each other’s base, the votes from Greater Springfield swamped the rest of the district. Despite its abysmal voter turnout, Springfield remains a Goliath in Democratic primaries in Hampden County. For example, in last year’s sheriff primary—which probably drew about the same turnout as next year’s primary will—Springfield represented about a third of Hampden County’s Democratic primary vote. Being a person of color and civil rights attorney, Amatul-Wadud might attract some of the city’s large vote share. A similar dynamic could play out in Holyoke. She probably won’t win either, but a cut of the turnout could suffice. To do even that, she will have to build up name recognition which takes time (and money). Neal is no pushover, however. The Springfield political machine may be past its warranty life, but the congressman is a tenacious campaigner. His able advocacy for Greater Springfield has sustained his support there. He prides himself on abstaining from negative advertising and parried Nuciforo and Shein’s critiques in 2012. While not left-wing, Neal has largely voted with his increasingly liberal caucus in recent years. While discontent does exist, it may not be pervasive enough on its own or sufficient to persuade more voters to turn him out. Moreover, many voters will consider how close Neal is to the House Ways & Means gavel. He will have virtually limitless support from state and national Democrats. Indeed, as Amatul-Wadud was announcing her bid, Neal was among Dems leading the charge against Republicans tax giveaway to the wealthy. Already among Democrats’ key national fundraisers, he’ll have no problem getting resources. State Democrats, for whom Neal has also raised money, definitely want him to stay on the glidepath to Ways & Means’ gavel. Many local Dems eyeing Neal’s seat five or 10 years from now, have no interest in letting Amatul-Wadud get the jump on them. Nonetheless, her first day on the trail sketched out a potential path. Amatul-Wadud began yesterday in Shelburne Falls, among the communities where activists are less than thrilled with Neal. She then traveled to Pittsfield, a city demographically favorable to Neal, but that Amatul-Wadud probably needs to crack. She ended in Springfield before a crowd that filled the Central Library community room. Challenges remain. Money will ultimately make or break Amatul-Wadud’s bid. Should another candidate claiming the space to Neal’s left emerge, her math begins to break down. In the end, Amatul-Wadud’s campaign may ultimately become a test of progressives and Neal skeptics’ influence. They do not need to win to prove it. Yet if the left wants to have any impact on how Neal votes—and potentially wields a gavel—they will have to at least make him sweat.